USMC Combat Field Fighter Knife | BUDK.com - Knives & Swords At The Lowest Prices! 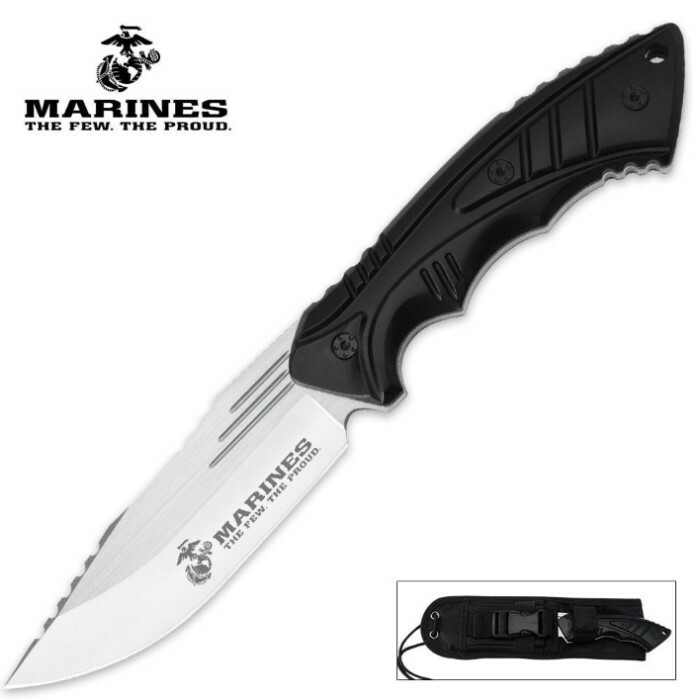 When the Marines are in the field, they need a powerful performance knife that they can count on and this fixed blade knife is surely one you can depend on! I bought this knife in March 2015. It is very sharp right out of the box. It slices through paper like a razor blade. The style and design are well thought of. It is full tang and feels very sturdy. Well balance when held. It would have been better to see a stamp of Made in the USA on the blade rather than a different country since it's already stamped with USMC but that shouldn't have any significant effect on the quality of this knife. Overall this is an excellent, high quality, razor sharp knife that is a steal for only $20. One of the best knife purchases I've ever made. This is an amazing knife! It is well put together and has a very nice weight. There is no way that this knife would ever come apart. If you are wondering if you should get it than take my advice, get it now. I have seen $100 knives that are much worse than this. Well worth the money.